Star Matt Damon and director Paul Greengrass have finally re-teamed to bring the Jason Bourne character back into his own Robert Ludlum movie franchise after a brief (unmentioned) detour with Jeremy Renner in the Bourne-less, The Bourne Legacy. Unfortunately, the unusually titled Jason Bourne is a mostly unnecessary, superfluous entry once again remaking the same basic premise seen far better in the sequels, Supremacy and Ultimatum. The new cast is as talented as the previous films' regulars. Tommy Lee Jones is the new CIA director while Alicia Vikander plays the analyst hunting Bourne down. Jones' character seems to have a deeper vendetta and relationship with Bourne that's never fully explained. Vikander does fine work but her character feels so buttoned down with an unspecified (and distracting), vaguely European accent. Riz Ahmed is looser playing a Mark Zuckerberg like figure in cahoots with the CIA. Franchise regular Julia Stiles takes a more notable role during the film's beginning as the precipitous for everything moving forward. Greengrass and his editor Christopher Rousse take over writing duties from franchise stalwart Tony Gilroy, who co-wrote every previous entry (while also directing Legacy). Where previous Bourne films were razor focused on slowly but thrillingly unpacking their themes of identity and power, Jason Bourne is more concerned with the globetrotting action to a premium. Gilroy's absence is clear, evident, and missed. This film brings the sense of action and Damon's character work absent from Legacy while it lacks the subtle sense of intrigue and complex espionage that ironically overtook that film. The first three films benefited from a balance of competing storytelling styles and methods, first with director Doug Liman and Gilroy then with Greengrass' increasingly loose, in the moment style for the two subsequent films. The unusual step of him co-writing the script with his editor implies they didn't so much write it as planned and choreographed elements of the bare film—Damon only has forty-five lines of dialogue in the entire film—as they set the scene and staging instead of the more chaotic meshing of writing and filming the previous films became notorious for. In the near decade since Ultimatum, the filmmakers feel too much the need to reference real-life counter-intelligence concerns namechecking things like WikiLeaks, hacking culture, and Facebook privacy concerns. Where the previous Bush-era films felt slightly ahead of their time for foreshadowing our current digital age, this film struggles to merely keep up. 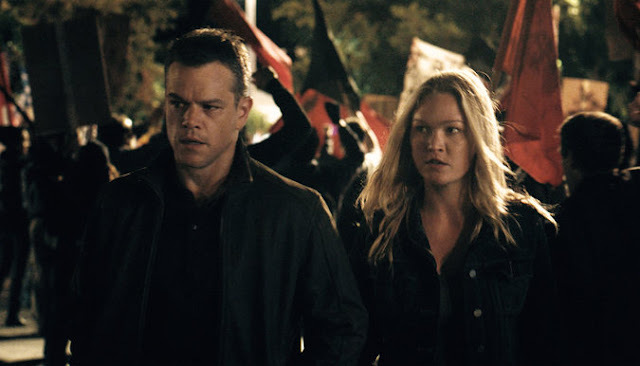 Ultimately, Jason Bourne never fully justifies its own existence or adequately explains why Damon's character finally revealed himself again to the world after all these years and such a satisfying conclusion in Ultimatum.